From the Paris Summit to Parliament Hill, climate change is creating a seismic shift in how Canadians think we should deal with the global crisis. In a lecture recorded in Winnipeg and a conversation with Paul Kennedy, author and activist Naomi Klein talks about her award-winning book This Changes Everything: Capitalism vs The Climate, and warns this is no time for small steps. 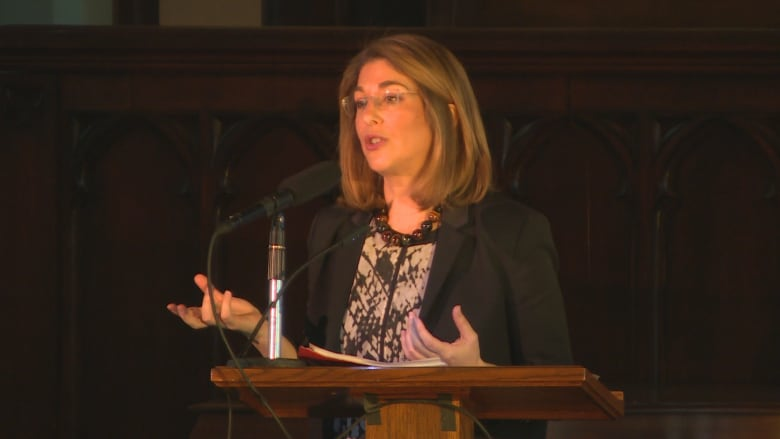 Naomi Klein presented her lecture in early April. It was sponsored by the Canadian Centre for Policy Alternatives. **This episode originally aired May 10, 2016. "I'm here to talk about the climate crisis and a few of you may be thinking, well that's silly because our politicians fixed that in December in Paris at the big climate summit to save the world. Remember seeing all of those politicians cheering wildly for themselves? It was so great, right? Remember that? Remember how sincere they were? Even our media, usually so cynical couldn't help getting in on the euphoria. Some of these headlines really stayed with me. One of the ones I like best is that the deal marks the end of the fossil fuel era! A little bit over the top and I'm sure you've all noticed the gas stations closing in droves since. And the fact that the front pages of our newspapers all across the country are still crowded with headlines about massive new tar sands pipelines that they want to build and LNG terminals they want to build in British Columbia, all of that is just one big typo right? Actually Exxon came out with a report a month after the deal was negotiated where they were talking to their investors about their long term prospects, and were reassuring investors that they believed that the share of the energy market taken up by oil and gas would continue to expand to mid-century. Which is strange because if we are going to keep the commitments that were made in Paris, we need to be off oil and gas by mid-century completely. So what is going on? Is what happened in Paris a huge political breakthrough? Or is it an ecological disaster? And the truth of the matter is that it is kind of both.